Mary Nadeau staffs the Mother Marianne Book Shoppe, which was unveiled and blessed on Mother Marianne’s feast day at St. Joseph-St. Patrick Parish. 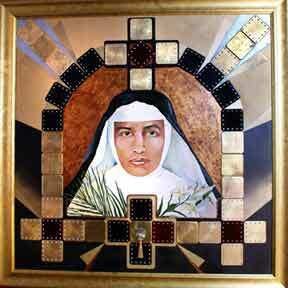 RIGHT: Portrait of Mother Marianne, donated by local artist Michele Ann LaColla to St. Joseph-St. Patrick Parish. UTICA  Some 200 people, including St. Joseph Fraternity Secular Franciscans, joined the clergy at St. Joseph-St. Patrick Church to celebrate Blessed Mother Marianne Cope’s feast day at an evening Mass on Wednesday, Jan. 23. 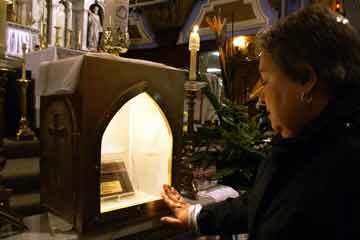 The celebration included the blessing of a reliquary to house her relic and the blessing of an inaugural Mother Marianne Book Shoppe in the church vestibule. Also, Mother Marianne Prayer Group coordinator Betty Frank, SFO, announced that an original mixed media portrait of Mother Marianne, which was donated to the parish by local artist Michele Ann LaColla, has been loaned to the Kirkland Art Center as part of an exhibition running until Feb. 20. The original artwork is based on a photograph of Mother Marianne at age 48 in Hawaii. LaColla said the portrait was her “reflection of a woman with heavenly devotion for the unfortunate outcasts of the earth.” The artwork was used on the cover of the feast day program. Fr. Richard Dellos, parish administrator, said the new reliquary was made by Bob Bick and Company using a tabernacle from the former St. George’s Church. The Mother Marianne Book Shoppe is dedicated to the memory of benefactor Paul Schremp, who donated money for Catholic education and evangelization. 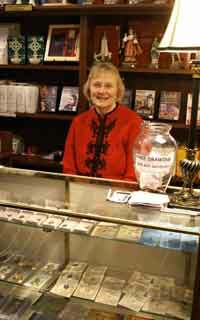 The shoppe features a variety of religious articles as well as books, CDs and DVDs. Father Dellos noted that the main vestibule would eventually house museum cases displaying parish historical articles as well as Blessed Mother Marianne items. where Mother Marianne grew up. Father Dellos and Fr. Ben Opara, parochial vicar, concelebrated the Mass. The homilist was Deacon Gilbert Nadeau. Mother Marianne is the parish daughter who went on to become a Franciscan missionary to the lepers of Molokai, Hawaii. As part of the cause for sainthood, she was beatified by the Vatican on May 14, 2005. In November 2006, St. Joseph-St. Patrick Parish broke ground for an outdoor shrine honoring Blessed Mother Marianne. It was officially dedicated and blessed on Oct. 3, 2007 by Syracuse Bishop James M. Moynihan.